The quote I made up to go around the playing card reads: Blogging is like a conversation around the table during a game of Canasta: sharing stories, commenting, building friendships, laughing, connecting. Here on my blog I participated in the Family x12 Blog Hop coordinated by Margie, Sian's Storytelling Sunday, Shimelle's Ten on the Tenth, and began Pass the Book: Year Two. I completed my coaching duties in the Finding Photo Freedom workshop and participated in the Big Idea Festival, the Write Now! workshop, and The Mother LOAD. 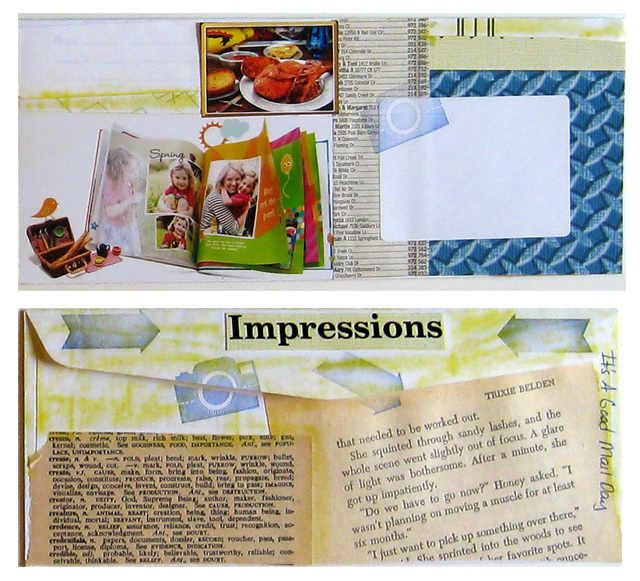 I need to create a couple of cards for September and October and will be starting the Double Take workshop on the 22nd. If in the midst of all this fun (along with tutoring once a week and leading two session of Ladies' Bible Study) I have any extra time, I'm hoping to work some more on Robbie's Graduation Mini-Album. Anyone else starting LOAD tomorrow? What else do you have planned for September? If you've been reading my blog for any length of time, the following revelation will probably not surprise you - I ALWAYS ENJOY A GOOD BOOK. So, it was easy for me to find something to scrap about when I learned that the Day 5 Big Idea Festival word was ENJOY. I used the 8x8 template that was provided with each day's word for my photos & title, printed it and used it to create a 12x12 layout that will go in our Activities We Enjoy album. The Big Idea Festival ended Saturday and even though I didn't complete a page for each of the twelve words, I'm thrilled with the six pages I did complete. Anyone else participate in the class? Did you complete all 12 pages? After many months of reading off and on, I've completed George W. Bush's autobiography/ memoir Decision Points. This is the second presidential autobiography I've read (the first was Reagan's An American Life - see my review here), and I thoroughly enjoyed it. It was especially meaningful since these are years and events that have affected my life. Each chapter of the book was based on a decision that President Bush made before and during his administration. The decisions ranged from quitting drinking to choosing personnel to fighting the war on terrorism. The book starts with what he says was one of the toughest decisions - his decision to quit drinking at the age of 40. He asked himself several questions including can "I continue to grow closer to the Almighty, or was alcohol becoming my god?" 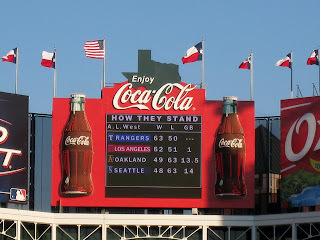 He goes on to talk about the decision to run for office, first for governor of Texas, then President of the United States, and the many decisions and considerations involved in choosing the team of personnel to serve with him. Obviously a huge part of his presidency involved the war on terrorism which became a central focus after the September 11, 2001, attacks on America. Many difficult decisions were made during that time, and he ends the chapter on America at war against terrorism with this thought: "History can debate the decisions I made, the policies I chose, and the tools I left behind. But there can be no debate about one fact: After the nightmare of September 11, America went seven and a half years without another successful terrorist attack on our soil. If I had to summarize my most meaningful accomplishment as president in one sentence, that would be it." I like the fact that President Bush admits that mistakes were made during his wartime presidency. For example, he states that in the war with Iraq there were "two errors that account for many of the setbacks we faced." The first of these was not responding "more quickly or aggressively when the security situation started to deteriorate after Saddam's regime fell" and the second was "intelligence failure on Iraq's WMD" (weapons of mass destruction). He also repeated expressed his sorrow at the loss of life - military and civilian, American and foreign - due to the effects of the wars in Afghanistan and Iraq. I highly recommend the book - it is well written and covers each topic individually rather than trying to tell the story of his presidency in chronological order. 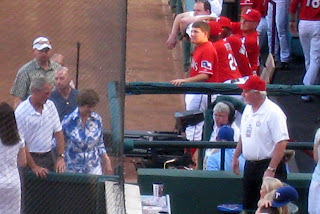 Just a few weeks ago, Robbie and I were able to watch the Texas Rangers baseball game with former President George W. & Laura Bush. Well, ok, there were 38, 210 other people in attendance, and the Bushes didn't really know we were there about 50 yards away, but we were all watching the game "together". 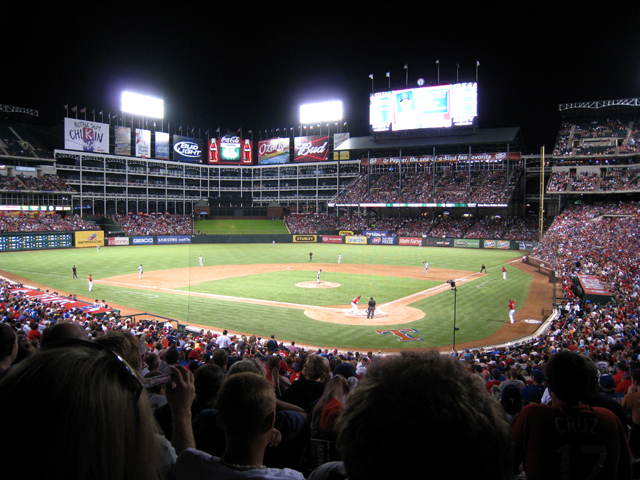 Before becoming governor of Texas and then President of the United States, George W. Bush was a minority owner in the Texas Rangers baseball team, and he and Laura still often attend their games. Robbie's company provided four tickets for us and we were able to share a fun evening with my Daddy and one of the pastors from our church. 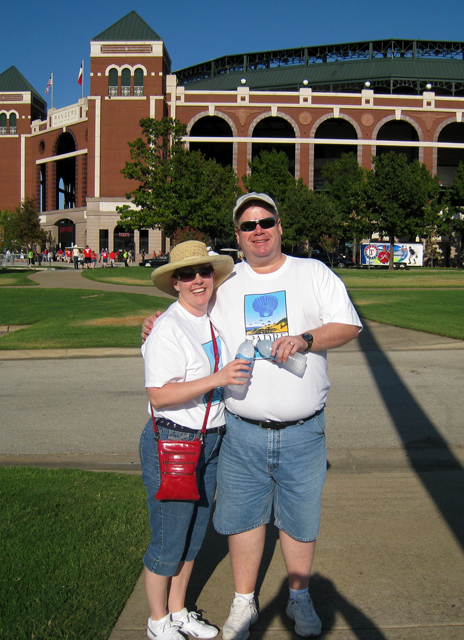 It was hot, but luckily the seats were in the shade throughout the game. There was a Texas Rangers Hall of Fame induction ceremony before the game, so many former Rangers were in attendance, including Nolan Ryan. We had a great evening, despite the unfortunate fact that the Rangers lost that game. 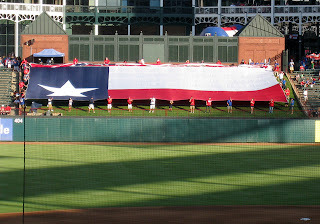 Here are a few of my favorite photos from that evening. It's been a lovely mail week here! 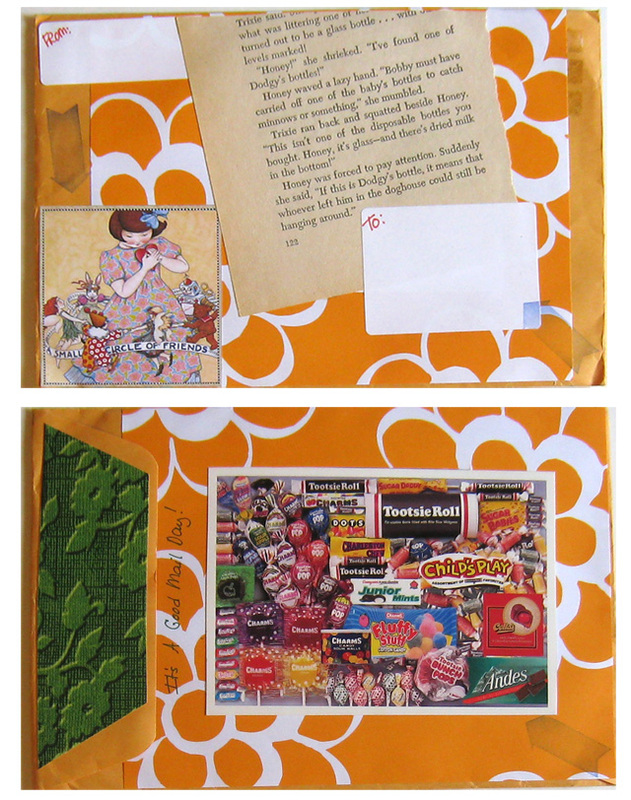 A few days ago I received a wonderful envelope from Cheri of Scrap Dreams. 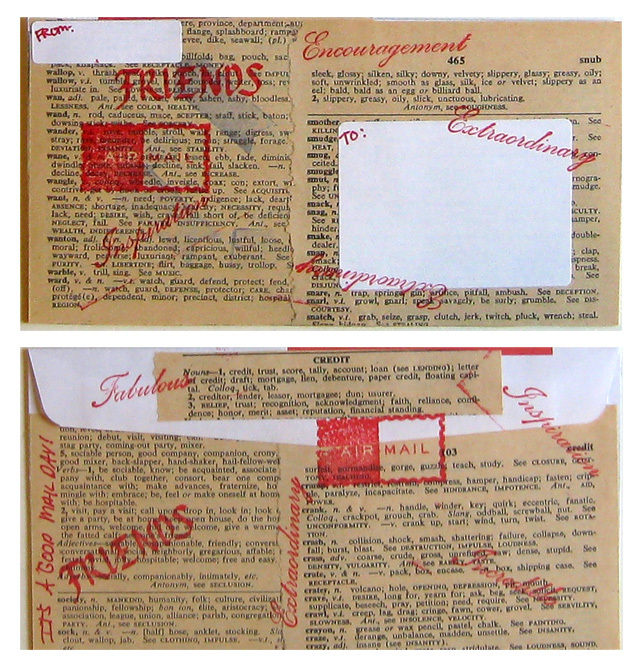 We had agreed to swap a few pages from old books, and I am thrilled with these pages from an old law book. Cheri even took time to pull out pages that included specifics for the state of Texas! And she surprised me with some cute doilies. (Thanks Cheri!) 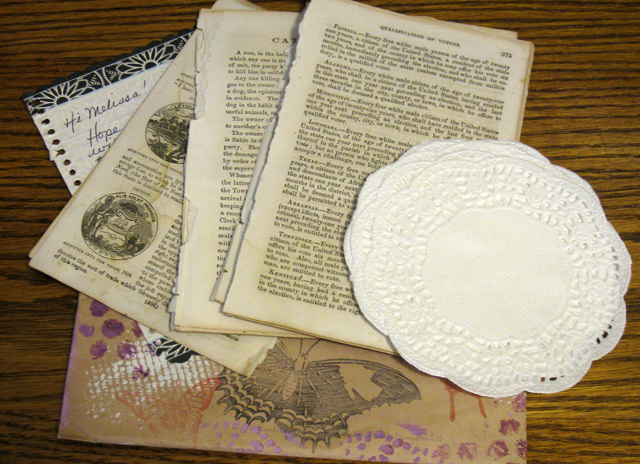 Watch for these items on a scrapbook layout soon. 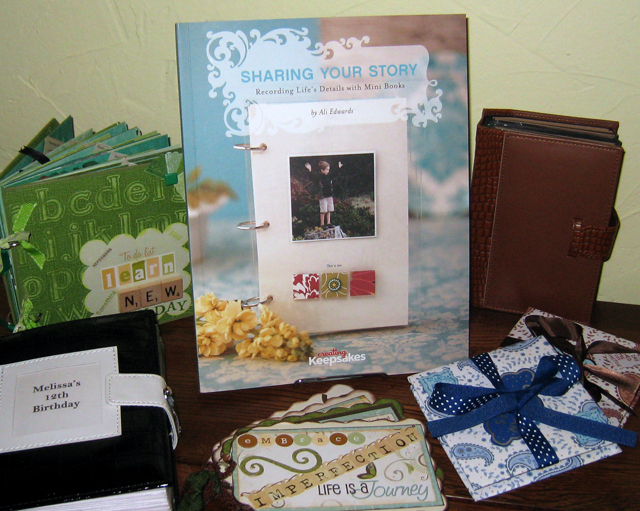 Now it's time for me to send out some Happy Mail of my own as I pass the Sharing Your Story book. The first recipient of this book is Karen from Random Reflections! Congratulations Karen - please email me your address at robbieandmelissa (at) sbcglobal (dot) net and I'll get it in the mail to you! When I first read that the word for Day 4 of the Big Idea Festival was GIVE, I could not come up with a layout idea. I thought it would definitely be an easy one for Brenda because she is always giving away the quilts that she makes (I have been the lucky recipient of quite a few!). When I mentioned to her that I wasn't sure what to scrap about, she said, "I can't believe you don't have any idea considering how much you've given to my kids over the years." Honestly, that comment really made my day, however I decided that my layouts probably already reflect that side of me as I often scrap about the wonderful visits with my nieces and nephews. I decided to flip through my storage binders from the past few years looking for inspiration. 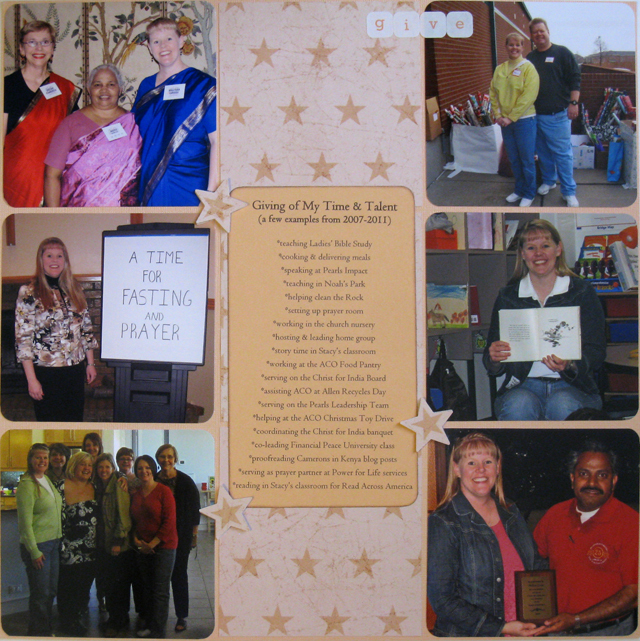 I began to notice photos of me doing various types of volunteer work - my way of giving my time and talents to good causes. There was a photo of me reading for story time in a 2nd grade classroom. Another photo showed me receiving a plaque in recognition of my service on the Board of Directors of a missionary organization, while another photo was taken the day Robbie & I helped load toys and bicycles during our community's Christmas toy drive. I decided these random photos would make the perfect GIVE layout. 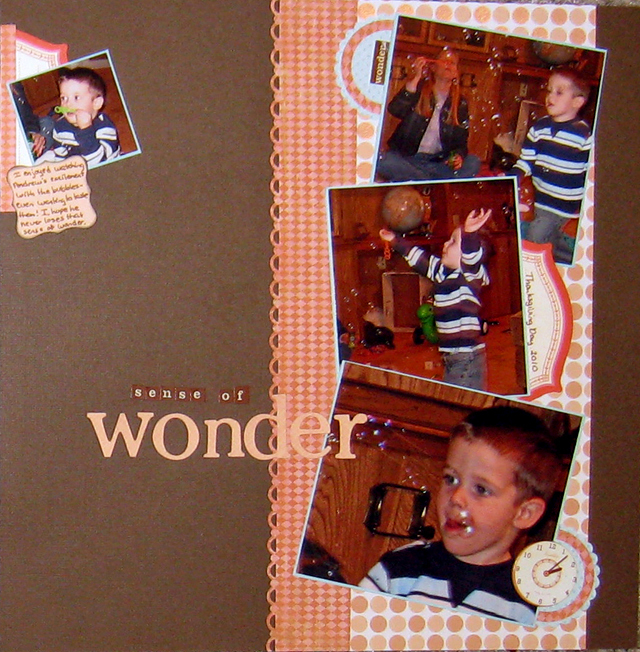 I also think this layout works for the Week 7 layout in The Mother LOAD workshop - to create an intentional layout, choosing embellishments that enhance the theme. I chose a patterned paper with stars because they often represent accomplishments and achievements, which I thought went along well with accomplishing something for the benefit of others. I feel truly blessed that I am so often able to give my time to others, whether it's simply reading a children's book or coordinating a banquet for 300 guests. I hope you are all doing well - the last few weeks have been extremely busy here as we adjust to Robbie's new full-time schedule and I prepare for teaching two Bible Study sessions this fall. I was somewhat behind on blog reading and my Google Reader was overflowing this morning. I took time to scroll through the posts quickly and then had to mark everything as read so I could have a fresh start. So, if you posted something you thought I'd really enjoy or linked back to me, please let me know as I don't want to miss anything. I'm really looking forward to getting back to my regular daily reading and being inspired by your posts later today! I absolutely love creating mini-albums, theme albums, and photo album scrapbooks, and Ali Edwards Sharing Your Story: Recording Life's Details with Mini Books is filled with inspiration and ideas for creating mini books. 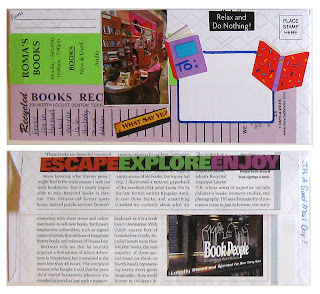 There are ideas for creating mini books for Record-Keeping, Memorabilia, Collections, Gift Albums, Collaborative Books, Books for Kids, Travel, and Personal Reflection. The photos of each of the mini books presented are fabulous. Along with Ali, there are several contributors to the book, and the mini book below by Dedra Long caught my eye. I think it would be a neat way to record our favorite TV & movie series, sharing each of our thoughts about why we enjoy the series, whether we've watched the entire series, and (in some cases) how many times. I've added this idea to my Scrapbooking Idea Journal. There's also a section on Mini-Book Bindings as well as Step-by-Step instructions for creating several types of albums from cardstock. If you'd like a chance to read and be inspired by this book, please leave a comment below telling me whether or not you've created any mini-books and what you like (or dislike) about them. 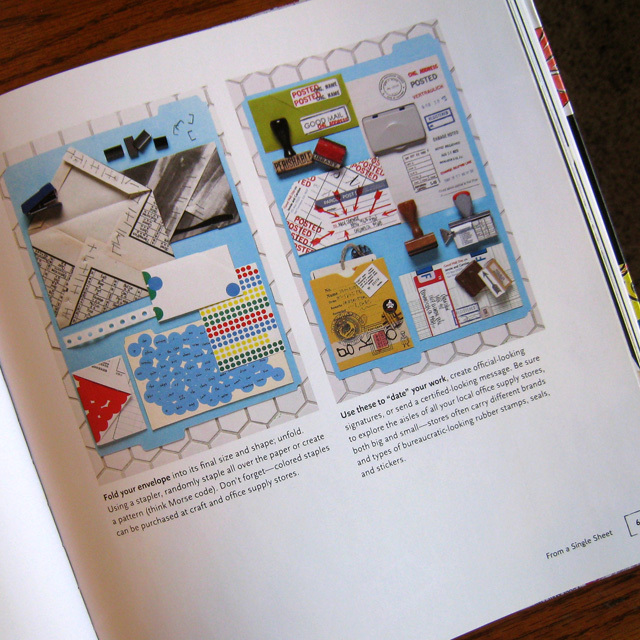 You can find all the details about Pass the Book: Year Two here. I'll draw a name at random and post the first recipient of this book next Thursday. Inspired by Big Idea Festival Day 3 word (LESS) and Shimelle's August 12 Sketch of the Week. 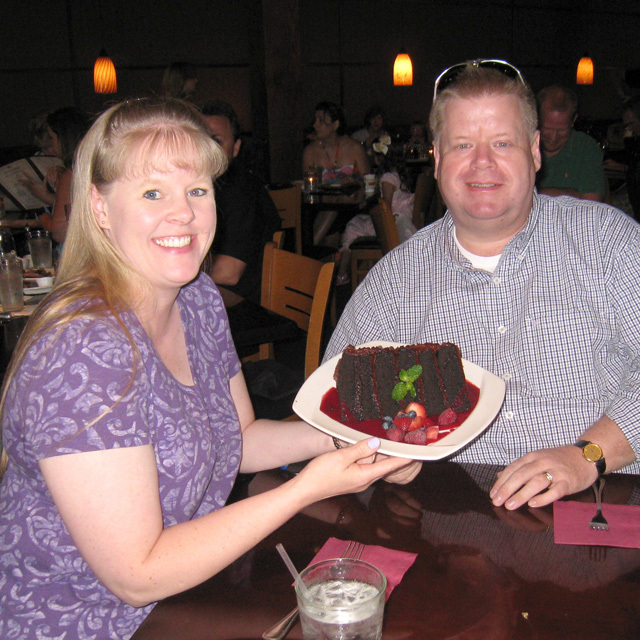 My dear friend Becky is celebrating her birthday today in Nairobi, Kenya, East Africa. Becky and her hubby Don retired to become missionaries last year. 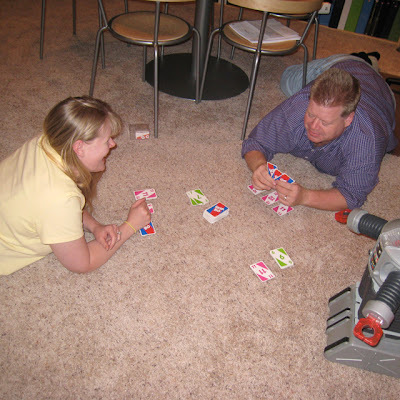 When Monday's Big Idea Festival word was revealed, I started thinking about Don & Becky. The word is SHARE, and that's what they are doing in Africa - sharing the gospel message. I also thought about the friendship that Becky and I share. 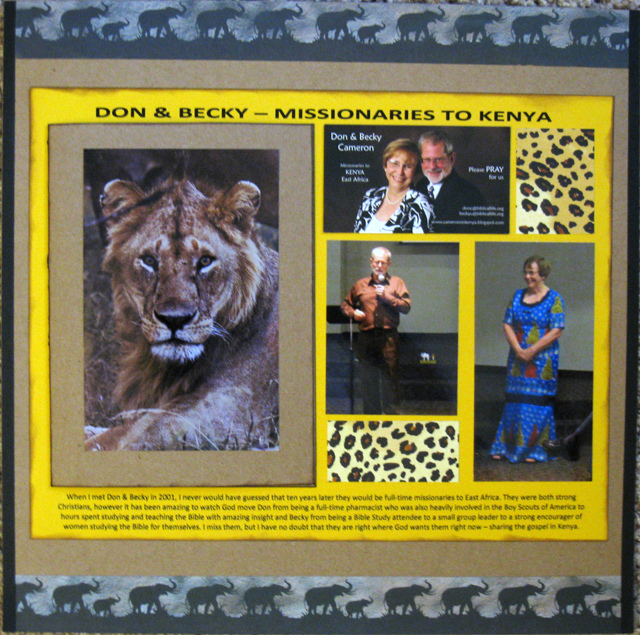 I also created a layout about Don & Becky and was able to include a challenge. This time it was a challenge from my sister Brenda. A couple of months ago, she gave me a strip of patterned paper with elephants on it and challenged me to use it on a layout. I laughed when I saw it because I already had the same strip - we had both trimmed it off the bottom of a piece of gray marbled patterned paper so we could use the paper on a layout. I had saved my strip knowing it might be good for a layout about Don & Becky, so I added Brenda's strip to it and was able to use them as a top & bottom border on this layout. Journaling Reads: When I met Don & Becky in 2001, I never would have guessed that ten years later they would be full-time missionaries to East Africa. They were both strong Christians, however it has been amazing to watch God move Don from being a full-time pharmacist who was also heavily involved in the Boy Scouts of America to hours spent studying and teaching the Bible with amazing insight and Becky from being a Bible Study attendee to a small group leader to a strong encourager of women studying the Bible for themselves. I miss them, but I have no doubt that they are right where God wants them right now – sharing the gospel in Kenya. You can read about Don & Becky's adventures in Africa on their blog - Camerons in Kenya. This year's theme for the Big Picture Classes Big Idea Festival is "Words to Live By." Each day a new word is revealed and one of the BPC teachers shares a layout with the word. There's still time to sign up for this FREE workshop - just click here. There are templates designed to be used in a min-album provided, however I've come up with my own plan. I will be creating a layout inspired by each word, probably a 12x12 layout that will go in my Library of Memories category albums. But, who knows, I might end up with different size layouts. I have the kit that BPC put together for this workshop and I'm planning to use a piece from the kit on each layout. I'll be sharing my first two layouts tomorrow, inspired by the word SHARE. 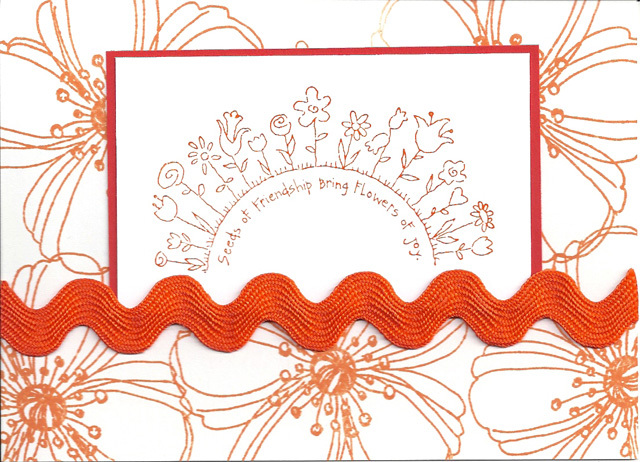 Some of you will remember how I've been playing along with Brenda this year, creating layouts using the same colors she's using in quilting. Well, this month Brenda is playing along with me and creating a mini-album for the Big Idea Festival. You can see her layouts here. Are you signed up for the workshop? If so, are you planning to do a mini-album or use the inspiration in some other way? The Write Now! 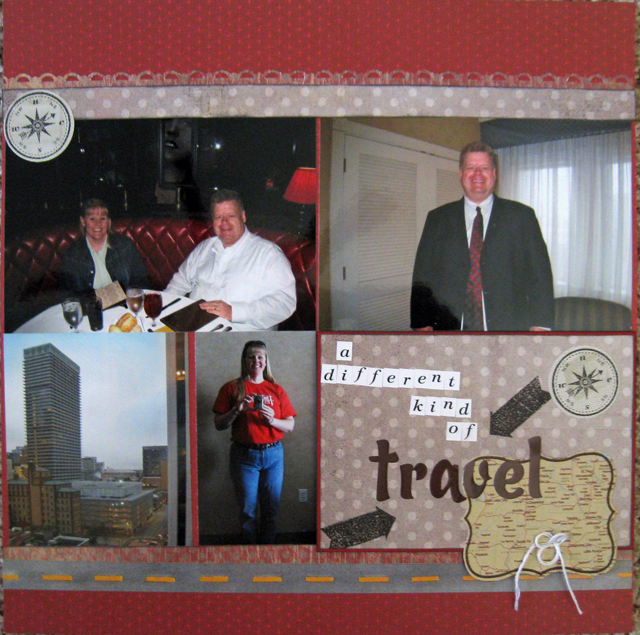 workshop at BPC has helped me focus on writing and journaling this past week, and I was inspired to create this layout using Shimelle's April 4x6 Photo Love sketch. The sketch was designed for four 4x6 photos, however I cropped several of my photos & ended up using six photos. 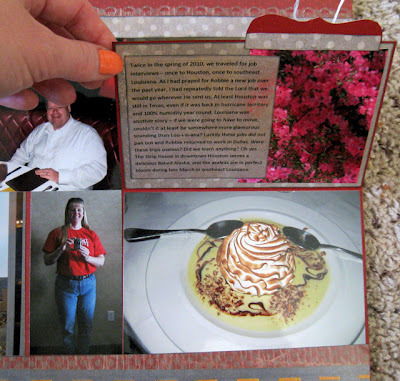 Two photos & the journaling are underneath the title flap. 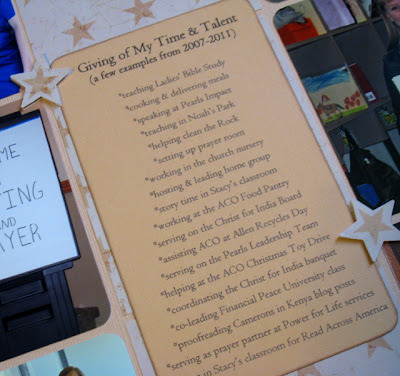 Journaling Reads: Twice in the spring of 2010, we traveled for job interviews – once to Houston, once to southeast Louisiana. As I had prayed for Robbie a new job over the past year, I had repeatedly told the Lord that we would go wherever He sent us. At least Houston was still in Texas, even if it was back in hurricane territory and 100% humidity year round. Louisiana was another story – if we were going to have to move, couldn’t it at least be somewhere more glamorous sounding than Lou-i-si-ana? Luckily these jobs did not pan out and Robbie returned to work in Dallas. Were these trips useless? Did we learn anything? Oh yes . . . The Strip House in downtown Houston serves a delicious Baked Alaska, and the azaleas are in perfect bloom during late March in southeast Louisiana. 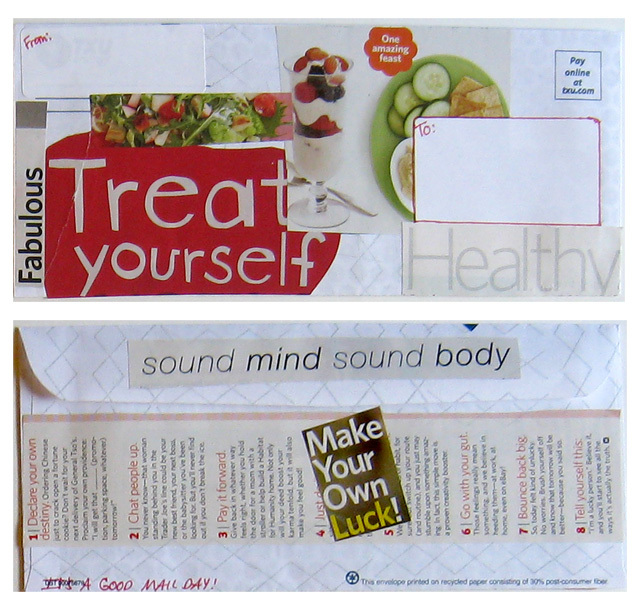 who said: I've been intimidated by the wonderful examples of MailArt I've seen on Blogs too, Melissa! Maybe it's time I put myself in the draw and find out for myself...love what you've done! Alison, I have your mailing address, so this book will be on its way to you soon. Please check out all the details on Sian's blog here. 1. It is going to be FUN! 2. It all started with Sian sending out a book each month for the past year. Most of those books are still circulating, so be sure to check out her Pass the Book page for updates on when those books become available for the next reader. 3. Year Two starts this month - I'll be passing the first book next week. 4. I'll choose a book each month and post about it here on my blog. If you'd like a chance to receive the book, leave a comment on that post. I'll pick a winner, announce it on my blog, and send the book on its way. 5. Anyone with an active blog is welcome to participate, books can be shipped around the world. 6. If you are the chosen recipient of the book, please email me your address & watch the mail for a fun package. Please enjoy the book, then post to pass it on, asking who would like to enjoy it next. 7.There is no requirement to review the book. This project is about sharing and making contact with the next person in the link, getting inspiration from the book - if you have time to make something or take a photo inspired by what you have read, that is wonderful (please share). If, when you receive the book you discover it's not really for you, think about who it would appeal to and write your post with them in mind. Pick out its good points, make it sound appealing! After about a week, draw a name, tell us and then mail the book off with a nice postcard saying hello. 8. When posting about Pass the Book:Year Two, please refer your readers back to the Pass the Book:Year Two page on my blog for all the information they need and please let me know whose name you draw so that I can keep the Pass the Book page updated with the latest information. 9. Writing in the books is ok, even encouraged. You may see my notes or ideas in the margins, feel free to add your own. 10. Books will travel for one year and then return "home" here to Texas. BONUS: It is going to be FUN (did I mention that already!)? This week in the Finding Photo Freedom workshop, Stacy encouraged us to take time to enjoy our favorite layouts and projects and then answer three questions: Why did you create this page/project? What did you learn in the process? Where will it be showcased/stored? 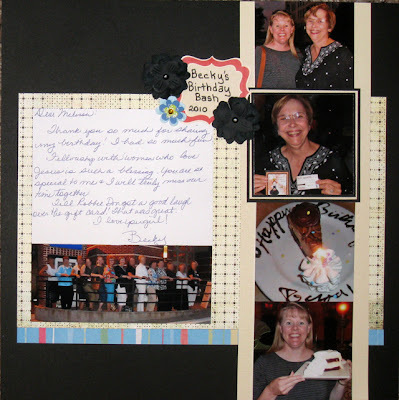 I chose a 7 ½” x 5 ½” scrapbook as one of my favorite projects. 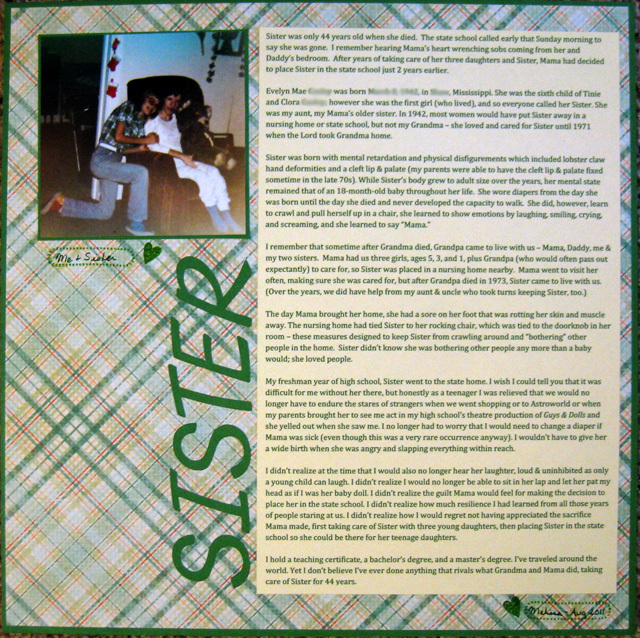 This album is stored in a basket with several other small albums in our front room. *The first time I traveled “on my own” – actually, I traveled with a dear girl friend of mine, however this was the first adult trip I had taken which wasn’t a family trip or a business trip. Another friend of ours, who was a truck driver, arranged his schedule so that he would have three days off in New York while we were there, so he joined us on our sightseeing several days. And our pastor (from Texas) had a son who lived in Brooklyn, so he met us several evenings for dinner as well. 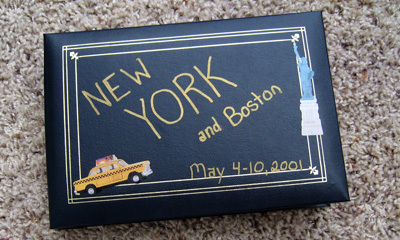 *The first time I visited New York City – growing up, we traveled to visit relatives for summer vacations. I never dreamed that I (little ol’ Melissa) would travel to New York! Plus we spent one day in Boston! *The first Broadway production I attended – obviously this goes hand-in-hand with being in NY for the first time. 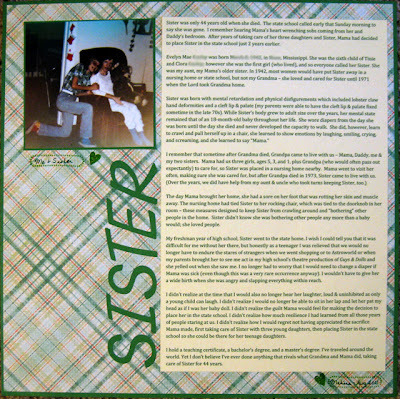 *The first mini-album I created – I’d created several theme albums, but none that were this small. I learned that I can fit a tremendous amount of information (photos, memorabilia & journaling) in a very small space. I did not complete this album until 4 or 5 years after the trip, and I learned that it is perfectly ok to let photos sit until there’s time and inspiration to scrap them. I pulled out my photos and memorabilia and was thrilled to find the little notebook I had taken on the trip. Each night when we returned to our hotel room, I recorded the things we did that day and the funny stories I wanted to remember. I am so glad I did this because as I read through it there were many many stories that I had forgotten and which were not reflected in the photos. Most of these funny stories are now recorded in this album. I was also delighted to discover how much memorabilia I had saved. I used memorabilia on 24 of the 40 pages. I especially enjoyed including maps as the background paper. I had a great time sitting and enjoying this album again, remembering that first “big” trip and all the fun we had, realizing that I didn’t even notice there wasn’t a single piece of patterned paper and that the only embellishments were stickers (I just came to that realization as I was typing up this blog post), and deciding it’s time to plan another trip soon. 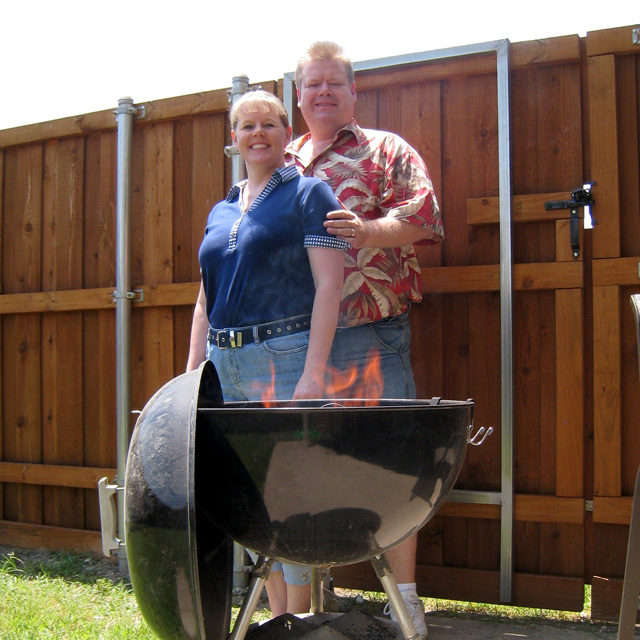 I’m so glad Stacy encouraged us to take time to enjoy our layouts and projects this week. 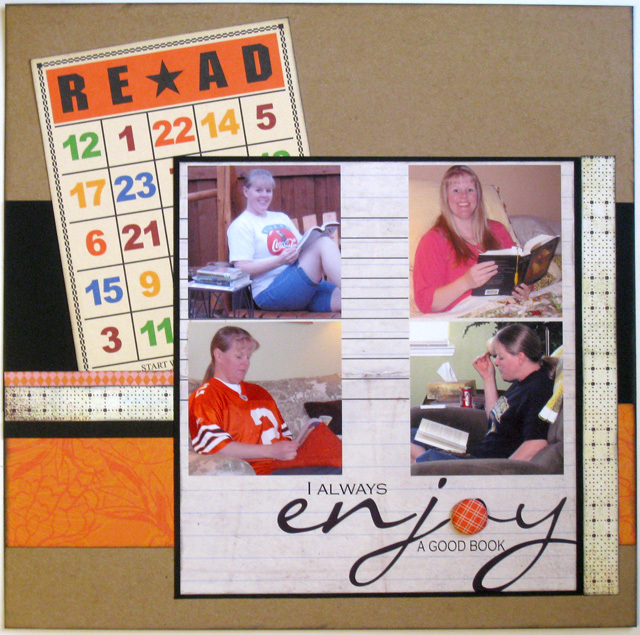 When was the last time you sat down and truly enjoyed one of your scrapbooks or projects? Sister was only 44 years old when she died. The state school called early that Sunday morning to say she was gone. I remember hearing Mama’s heart wrenching sobs coming from her and Daddy’s bedroom. After years of taking care of her three daughters and Sister, Mama had decided to place Sister in the state school just 2 years earlier. Evelyn Mae was born in 1942 in Mississippi. She was the sixth child of Tinie and Clora; however she was the first girl (who lived), and so everyone called her Sister. She was my aunt, my Mama’s older sister. In 1942, most women would have put Sister away in a nursing home or state school, but not my Grandma – she loved and cared for Sister until 1971 when the Lord took Grandma home. The day Mama brought her home, she had a sore on her foot that was rotting her skin and muscle away. The nursing home had tied Sister to her rocking chair, which was tied to the doorknob in her room – these measures designed to keep Sister from crawling around and “bothering” other people in the home. Sister didn’t know she was bothering other people any more than a baby would; she loved people. My freshman year of high school, Sister went to the state home. I wish I could tell you that it was difficult for me without her there, but honestly as a teenager I was relieved that we would no longer have to endure the stares of strangers when we went shopping or to Astroworld or when my parents brought her to see me act in my high school’s theatre production of Guys & Dolls and she yelled out when she saw me. I no longer had to worry that I would need to change a diaper if Mama was sick (even though this was a very rare occurrence anyway). I wouldn’t have to give her a wide birth when she was angry and slapping everything within reach. I didn’t realize at the time that I would also no longer hear her laughter, loud & uninhibited as only a young child can laugh. I didn’t realize I would no longer be able to sit in her lap and let her pat my head as if I was her baby doll. I didn’t realize the guilt Mama would feel for making the decision to place her in the state school. I didn’t realize how much resilience I had learned from all those years of people staring at us. I didn’t realize how I would regret not having appreciated the sacrifice Mama made, first taking care of Sister with three young daughters, then placing Sister in the state school so she could be there for her teenage daughters. I hold a teaching certificate, a bachelor’s degree, and a master’s degree. I’ve traveled around the world. Yet I don’t believe I’ve ever done anything that rivals what Grandma and Mama did, taking care of Sister for 44 years. This post is part of Sian's Storytelling Sunday series. To read more stories, click here. If you've arrived here from Margie's blog - Welcome! If you're a regular, so glad to "see" you! For this month's Familyx12 Blog Hop, I'm sharing our family photos from June & July as I continue my goal of getting at least one photo of Robbie & me together each month this year. We actually had several photos of us together for each of the past two months, and I had a difficult time choosing. So, I'm sharing two photos from each month. Most of our photos are posed since we have to ask someone to take our photo, so I'm excited to share this fun shot that my niece took during her visit in June. 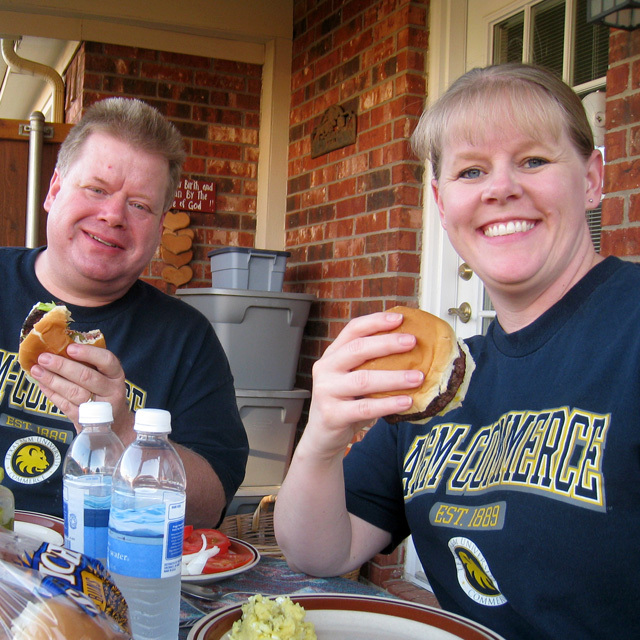 And here's one a few days later, enjoying a hamburger on our back patio. And lest you think all we do is eat and play games, here's a shot I took using the self-timer. Obviously, we have to prepare all that food we eat sometime! 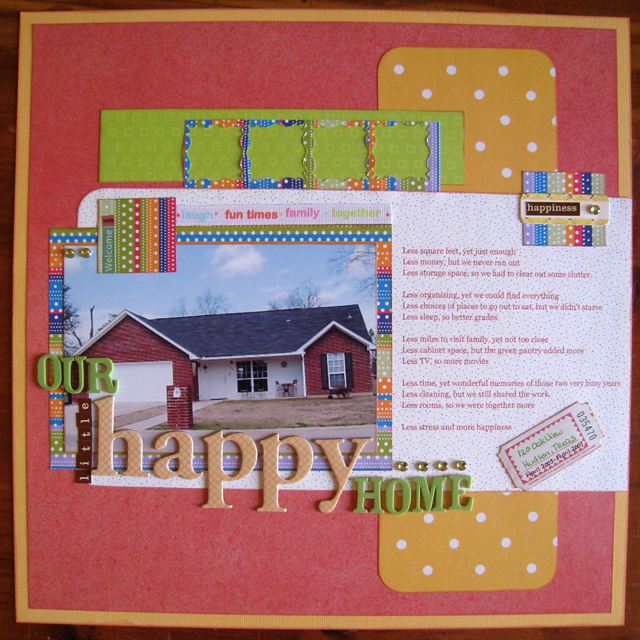 Your next stop is Scrapping Thoughts, hop on over and check out Carol Anne's family photo. Here's the complete list in case you get lost along the way! It's time to Pass the Book - the Good Mail Day book that is! I thoroughly enjoyed my read through this book. 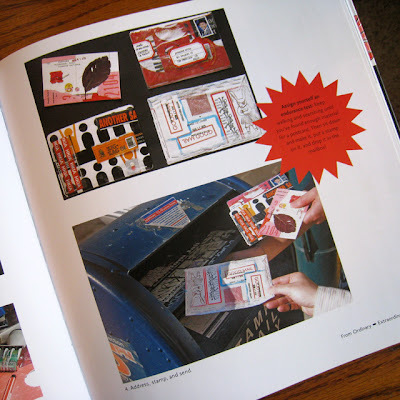 The book shares a little bit about the history of Postal Art, lists the Dos & Don'ts and Etiquette for preparing, sending, and acknowledging mail art, and is filled with examples of mail art pieces as well as ideas for materials to use in producing your own creations. I have to admit that I've been a little intimidated over the past few months, reading about and seeing such lovely mail art pieces being exchanged among the bloggers I follow. There have been some truly artistic pieces with lots of painting and drawing and exquisite use of materials. 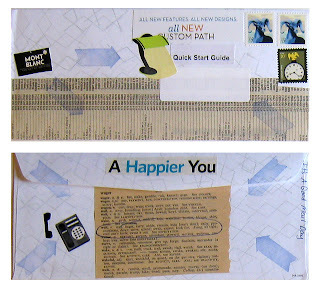 However, I was relieved to see that mail art can simply be created using found materials in a collage fashion on any type of envelope (or even a handmade one!). 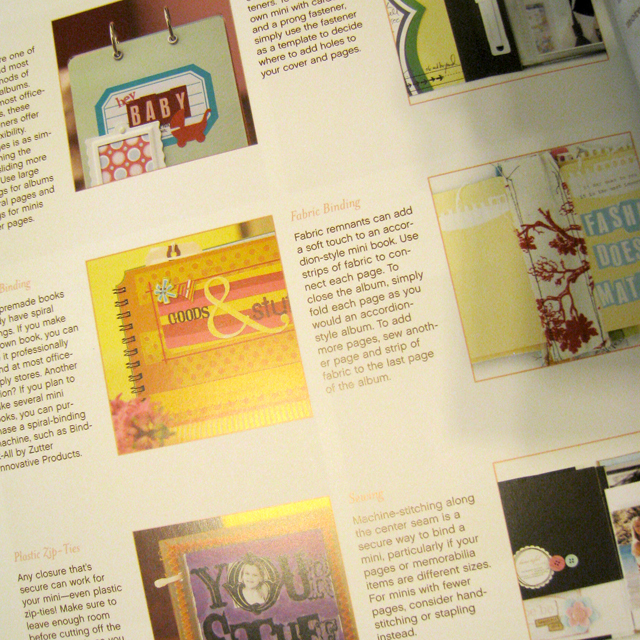 This is more my style, and I have enjoyed preparing a few items to send out to bloggy friends around the world. 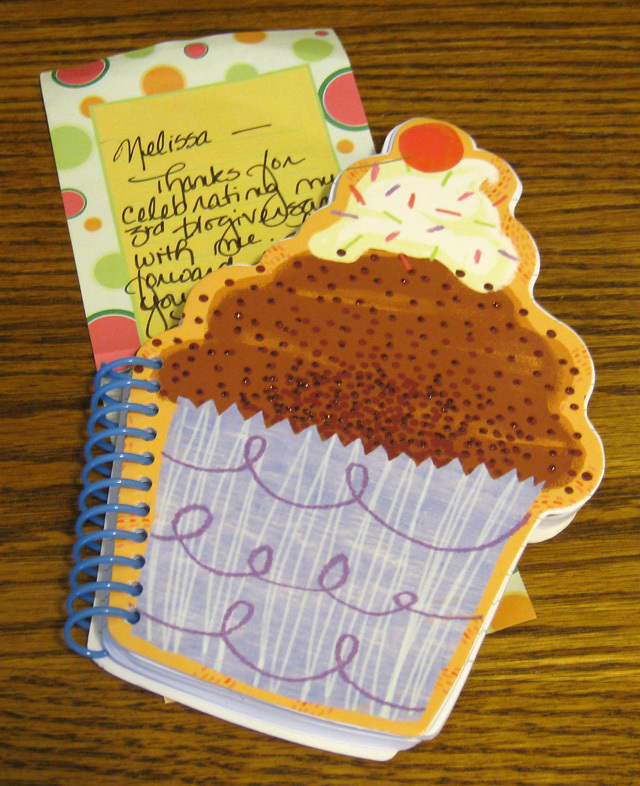 I chose items to use on the envelopes with specific individuals in mind. 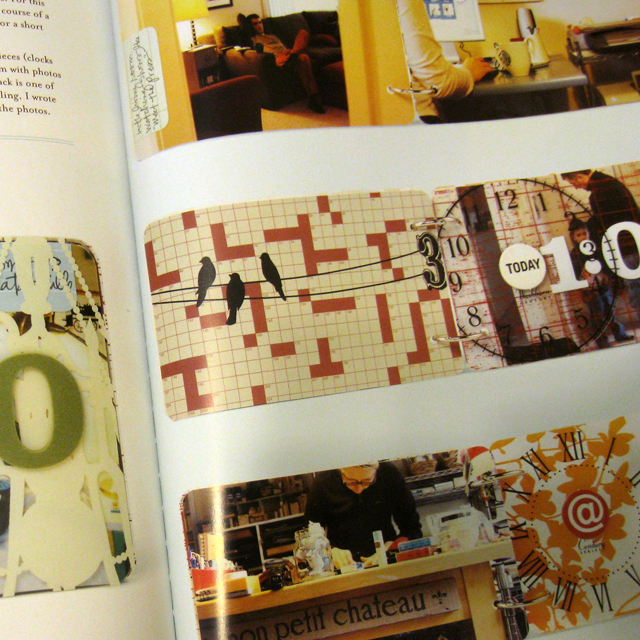 For a bloggy friend who shares my love of reading - miscellaneous bookmarks, parts of a magazine article about bookstores and book stickers. 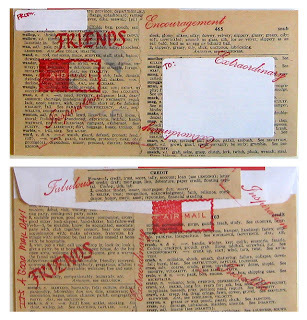 For a bloggy friend who enjoys words - old dictionary pages & word stamps. For a bloggy friend who is working on healthy living and weight loss - healthy food photos & snippets of magazine articles. For a bloggy friend who is waiting on a phone call - telephone pages & the dictionary page for the word "wait". 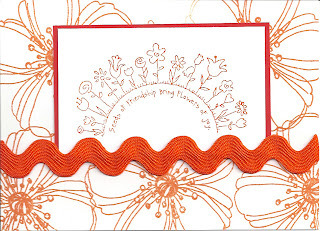 And for two more bloggy friends - a few miscellaneous fun, colorful items. 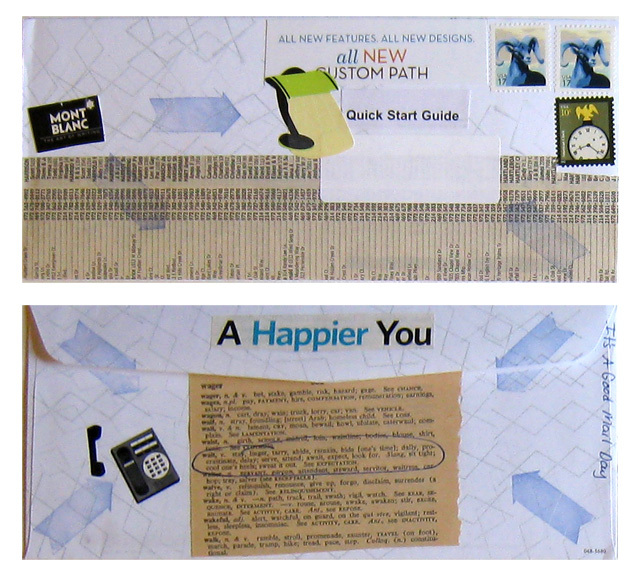 If you would like a chance to be the next recipient of Good Mail Day: A Primer for Making Eye-Popping Postal Art, please leave a comment below telling me about the last piece of mail you received that truly made you smile. I'll pick a winner at random from all comments left by noon (CST) Wednesday, August 10. 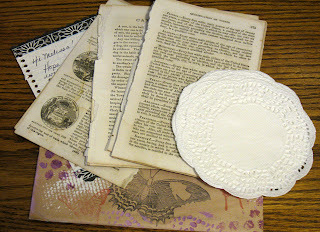 Please check out Sian's Pass the Book page for all the details on this fun book sharing project. I am so grateful that Sian has shared her books with us over the past year (and will continue to do so as each book will travel for a year before returning home to Sian). In fact, there's still time to get in the draw for the last book she'll be sending out - check it out here. 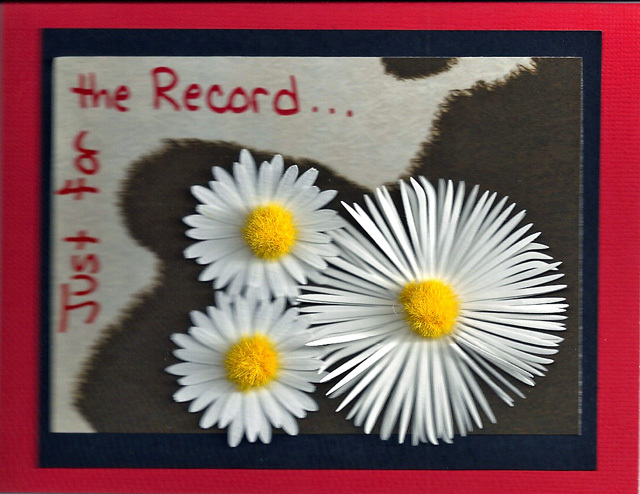 But the fun doesn't stop there - I am totally excited to announce that I will be continuing this great project with Pass the Book Year Two! I'll be adding a page to my blog about it in the next week and plan to pass the first book within the next two weeks, so be sure to check back often as we keep passing the books!